I am getting some error message that is saying 'Error: identifier 'XXXX' out of scope' in VS 2012. I found this still happens with even very simple class as below. I put break point inside of constructor and added test1 and test2 on watch. Here is screenshot. As you can see image, test1 that is declared in header file is 'out of scope'. 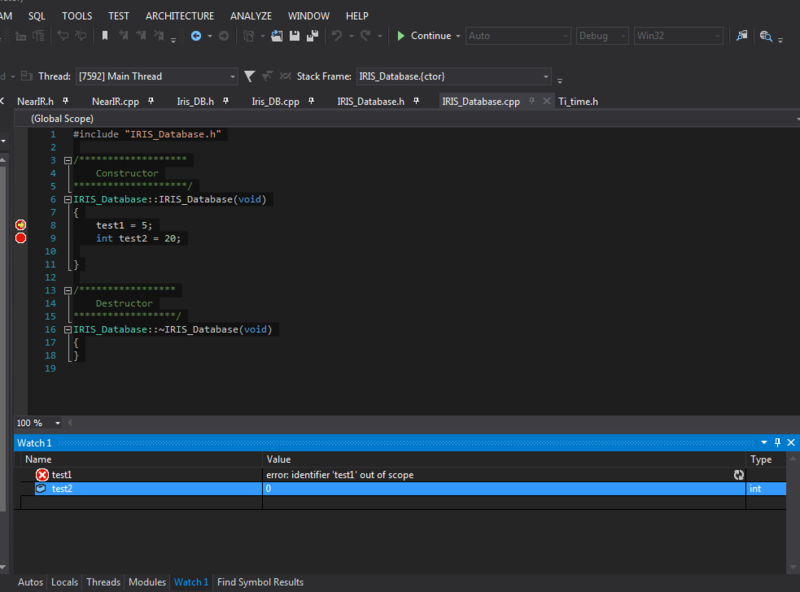 The test2, local variable that is declared in constructor, is OK. I can track test2 but not test1. Here is code that initiate this class from main function. Optimization is disabled in project property and this is running as debug mode. My code is C++/CLI mixed with Windows forms. So, /clr option is enabled. Platform Toolset is v110 which is VS 2012. Here is all options from property page. If you want to see specific options please let me know. /GS /analyze- /W3 /Zc:wchar_t /I"../IRDB_Include" /Zi /Od /sdl- /Fd"Debug\vc110.pdb" /fp:precise /D "_CRT_SECURE_NO_WARNINGS" /D "WIN32" /D "_DEBUG" /D "_CONSOLE" /D "_UNICODE" /D "UNICODE" /errorReport:prompt /WX- /Zc:forScope /Oy- /clr /FU"C:\Program Files\Reference Assemblies\Microsoft\Framework.NETFramework\v4.0\mscorlib.dll" /FU"C:\Program Files\Reference Assemblies\Microsoft\Framework.NETFramework\v4.0\System.Data.dll" /FU"C:\Program Files\Reference Assemblies\Microsoft\Framework.NETFramework\v4.0\System.dll" /FU"C:\Program Files\Reference Assemblies\Microsoft\Framework.NETFramework\v4.0\System.Drawing.dll" /FU"C:\Program Files\Reference Assemblies\Microsoft\Framework.NETFramework\v4.0\System.Windows.Forms.dll" /FU"C:\Program Files\Reference Assemblies\Microsoft\Framework.NETFramework\v4.0\System.Xml.dll" /MDd /Fa"Debug\" /EHa /nologo /Fo"Debug\" /Fp"Debug\NearIR.pch"
On the flip side, test2 is a local variable to the constructor and is stored locally to the function. Thus, it is always accessible anywhere in that function. This is just a problem with the Watch tool. It takes some extra work, but a good debugger should be able to show that a class's member variables exist within the constructor. MS said that they're working on this issue. Not the answer you're looking for? Browse other questions tagged visual-studio-2012 c++-cli or ask your own question.